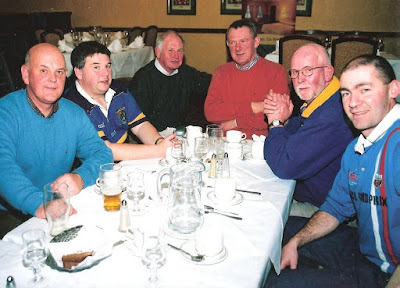 L to R: Bernard Gorman, Michael Scanlon, Tony Mansfield, Pakie Hurney, Jimmy O'Leary, Pajo Lanigan. This week's photo shows members of the management team and club officers at the post-match meal following Abbeyside's 2-9 to 1-11 County U21 Hurling Championship Final victory over Ballygunner at Fraher Field in 2006. The win over the Eastern Champions secured our third county title at this grade and second in three years.